The Currency Wars' "Pearl Harbor"
The most dramatic battle yet in the currency wars took place last Thursday. On Thursday, the Swiss National Bank pulled a similar stunt. Last November, the Swiss citizens voted on a referendum to require an informal link of the Swiss Franc to gold. 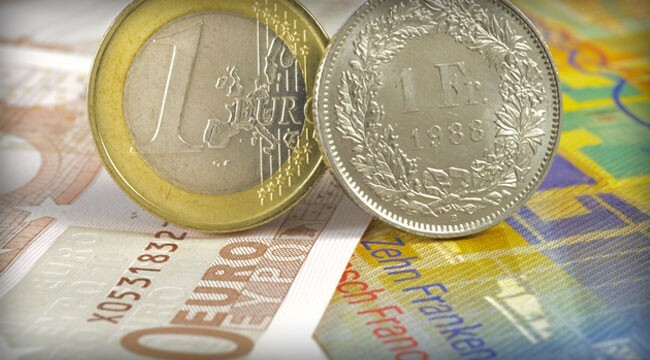 The Swiss National Bank argued against the referendum on the ground that it would cause them to break the peg of the Swiss Franc to the Euro. P.S. I gave Daily Reckoning email subscribers a way to access my brand-new Currency Wars Alert. It’s just one of the many benefits of being a Daily Reckoning subscriber. It’s free to sign up — simply click here and you’ll get our team’s insights each day the market’s open.